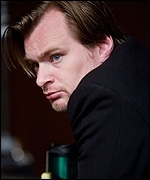 Christopher Nolan To Enter “The Twilight Zone?” | The Cineaste's Lament. “But unlike the 1983 film, they wouldn’t all be contributing a segment: the plan this time around is to focus on a single storyline with one man in charge. Now the question is which of the names on the shortlist (if any, given the changeable nature of directing assignments) will hoist the megaphone. This entry was posted in Film News, Horror, Reboots, Sci-Fi and tagged Christopher Nolan, Inception, Rod Serling, The Dark Knight Rises, The Golden Age of Television, The Twilight Zone. Bookmark the permalink.